They grow them BIG in Scotland. The run down to Adelaide was quiet and uneventful. The temperature was 38c and it was hard to get out of the air – conditioned car at times :o) I managed to get all the things I wanted done and was able to get repairs to my Filofax. It’s close to 25 years old and with TLC it should be still going in another 25 years. 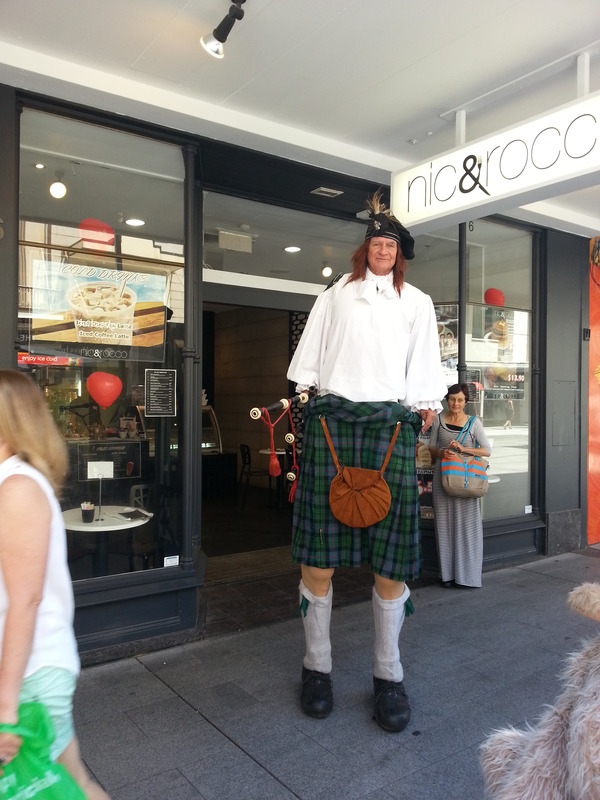 Rundle Mall was most entertaining, despite the heat. I always like the buskers in the Mall. I had been asked to get a couple of things but in that I failed – out of stock. Of course it was crush room only – half the Mall is being dug up again so there were narrow walkways at either side of the construction areas. The fellow in the photograph is quite real, I had to crane my neck just to talk to him. Lots of people were taking photographs with their children standing next to him. Actually, If you really look at the hands, they don’t really match up with the size of the person, so, although I was not about to ask, the person was real enough, but I don’t think the height was. But regardless, he was walking well and it really was well done – however it’s done. Tomorrow the temperature will be 42c and I will be driving in the hottest part of the day. By the time the meeting finishes, I do not stay for lunch, and I get on the road again, it will be well after 1pm. Of course that’s depending on several people not talking for as long as they generally do. got bigger as I got closer. nearest I have ever been to a bushfire. 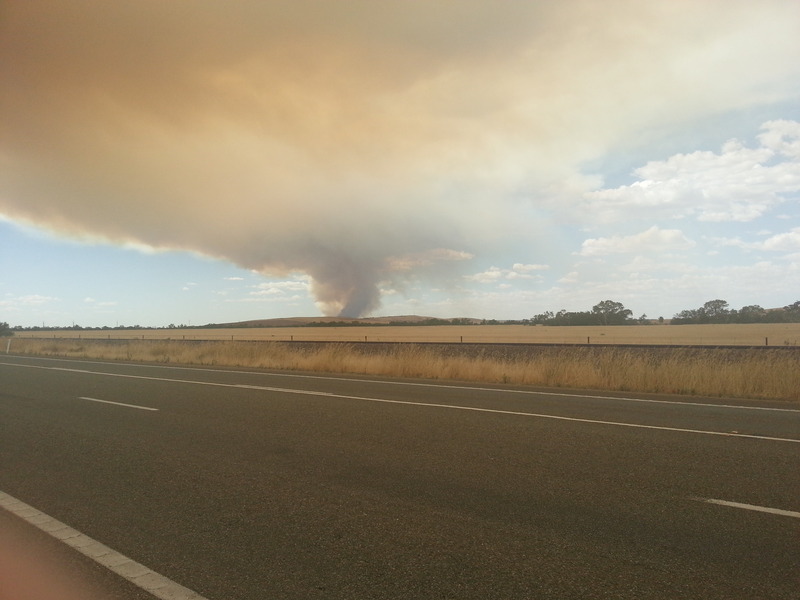 The emergency services on the car radio were informing people to be ready for evacuation and that the fire had breached the containment lines and was now out of control and the flames were now visible as it sweeps towards the National Highway. 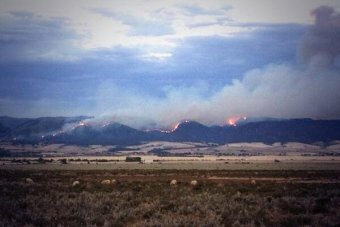 This is now the worst fire since Black Tuesday when the Mount Remarkable National Forest went up in flames and threatened the towns of Wilmington and Melrose not to mention the fuel depot at Mambray Creek. Unfortunately Wilmington as well as Warnertown are both in the firing line. The fire can now be seen from here as it lights up the horizon on the other side of the Gulf. ← Specialists, high heat and driving again.